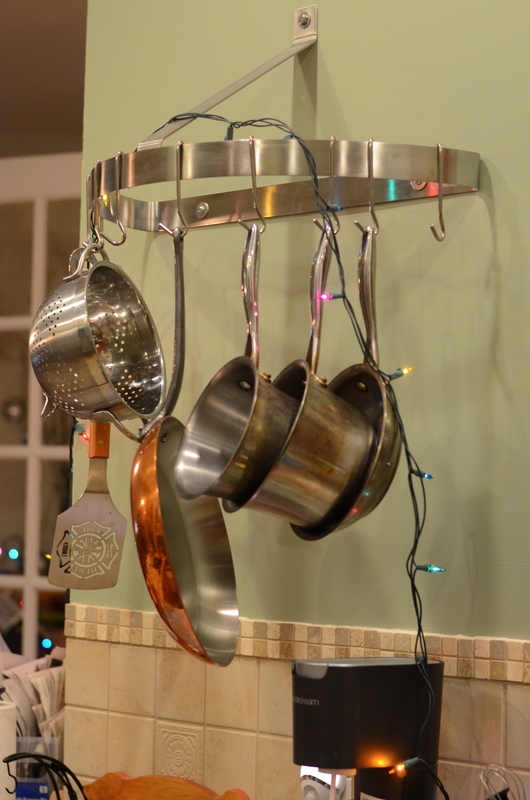 I had a mini epiphany the other night, over a copper pan. I was about to execute a simple chicken piccata recipe in the short period of time I had before leaving for choir rehearsal. It called for one of those shiny stainless steel pans that conduct heat very well (read: All-Clad, or in my case, Costco All-Clad knockoff), because you sear the meat and then boil liquid to make a sauce scraping up the brown bits. But the four chicken cutlets I had weren’t going to really fit in any of the sizes of Kirkland sauté pans. I had two choices: cook them in two batches in the proper style pan, or cook them in a large nonstick pan that wouldn’t brown the meat nicely. Actually, I had another choice. 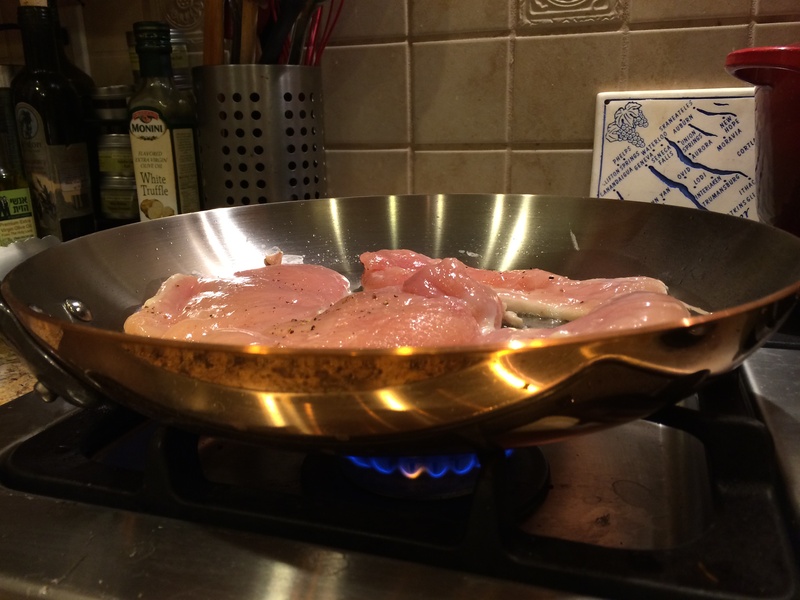 That beautiful, shiny, glamorous, high-quality copper pan, which we received as a wedding gift more than three years ago and have never used, is the perfect size for browning four chicken cutlets in a pan. So I did it. I have complaints about certain other people, who refuse to make a decision or take action on a matter and resist discussion because they say they are behind on so many other important responsibilities that need addressing first. Yet I witness them succumb to so many other distractions. Then days, weeks, months go by. I can’t help but wonder how hard it would be to devote 30 minutes to the subject in question? But I was acting like one of those people. 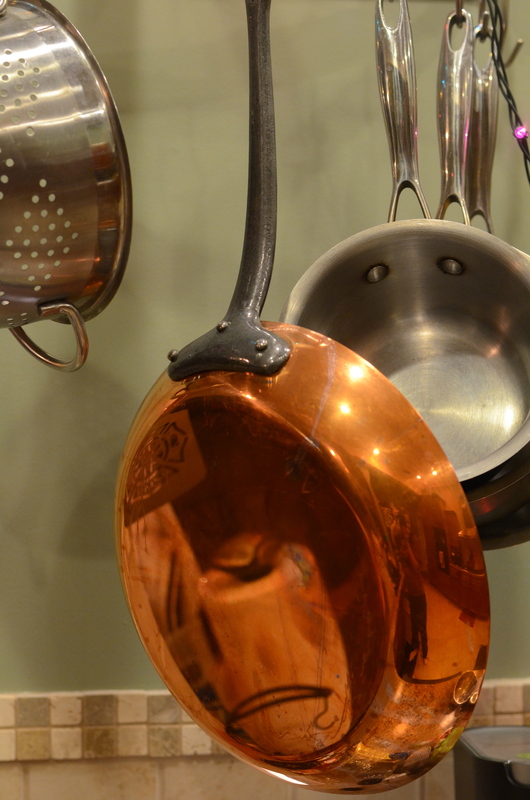 I thought to myself, once I have a weekend night set aside for cooking a fancy glorious feast, perhaps involving lobster and scallops and truffle oil, then I will ceremoniously take the copper pan from its throne, and actually cook with it. Right then and there, I decided that I want to change my outlook in the new year. I want to tackle my “tasks” and projects head-on. If I call these “goals,” what is a goal without a timeline? If it was for paid work, I would have a deadline, or at least try to set one for myself. At home, there are a handful of piles scattered about, having to do with projects that aren’t even necessarily that important, in the grand scheme of things, but they have been hanging over my head for a while; I’m talking well before the holiday season (so feel free to call me out when I use that excuse in public). At some point, I need to set aside 30 minutes for the project, or ditch it all together (ideally the materials can be donated rather than trashed). There is the tray full of 200+ chopsticks I rescued from disposal and imagined that they would be perfect for something crafty. There is the manilla envelope messily stuffed with wedding cards we received, again, three years ago, which I hoped to re-read, sort through to preserve perhaps some of the most precious, and recycle the rest. There’s the junk mail I collected last May and June so that I could submit the information to DMAchoice.org and reduce the quantity we receive. And there is the small stack of books for recreational reading that I have barely dented. I can do better at managing these personal things. I could also change my approach to things like the copper pot, which I was “saving for a special occasion,” and remember that life is short–you never know exactly how short it is. The year started out well. Matt and I were hanging out with some friends on New Year’s Day when the topic come up of our wine collection. Matt observed that there must be several wines we’ve had on hand for quite some time, including a 1995 Red Bordeaux blend, and we’re not sure when they are supposed to be consumed. So I decided to pull that wine out, to move it to the top of our queue of wines to drink. Then, I Googled the wine for its recommended drinking dates/years, and found it should be consumed through 2013. Only 1 day late! We opened it then and there and enjoyed it with friends over a game of cards. 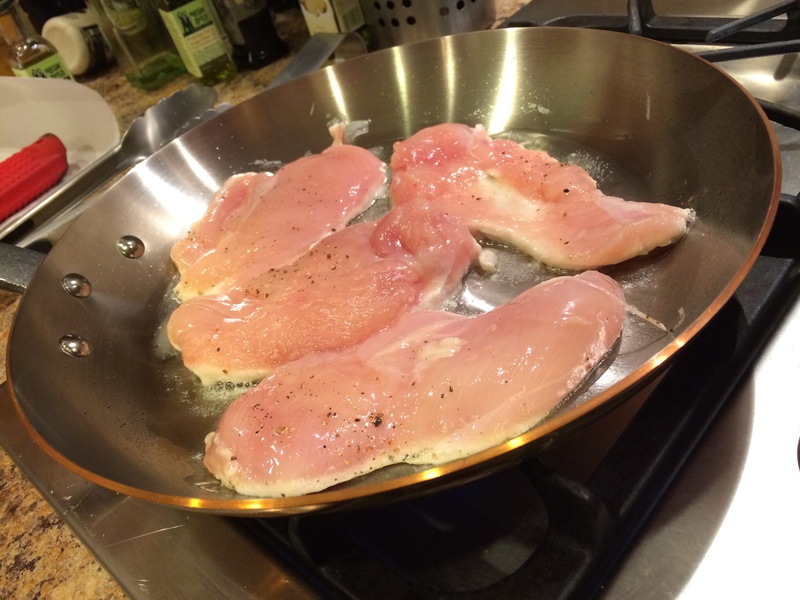 Oh, and here’s the chicken picatta recipe, in case you’re interested. It’s one of those simple and delicious recipes that can usually be made with what you have on hand. Sprinkle cutlets with salt and pepper. Heat a large skillet over medium-high heat. Add 1 1/2 teaspoons oil and turn to coat pan. Add 4 cutlets, brown and cook 2 minutes on each side or until done (instant read thermometer reads 165 degrees F). Remove cutlets from pan; keep warm. Add 1 Tablespoon butter to pan to melt. Sauté shallots and garlic in pan for 1 minute. Increase heat, add wine, bring to a boil, and cook 2 minutes, scraping pan to loosen browned bits. Use a whisk to thoroughly combine chicken stock and flour. Add stock mixture to pan, and return to a boil. Cook 5 minutes or until liquid is reduced by half. 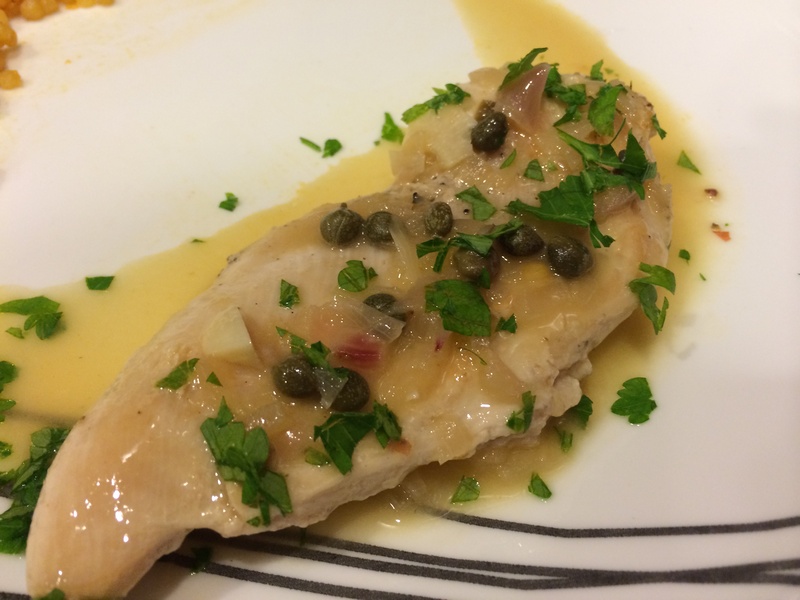 Remove from heat; stir in remaining 1 Tablespoon butter, juice, and capers. Pour over cutlets. Garnish with parsley. Here’s the pan after it has been used and washed. I think it still looks great, don’t you? This entry was posted in Chicken, Fast and easy, Fresh Herbs, Recipes and tagged chicken cutlets, chicken piccata recipe, copper pan, New Year. Bookmark the permalink. I was curious about the After version of the pan. It looks lovely!